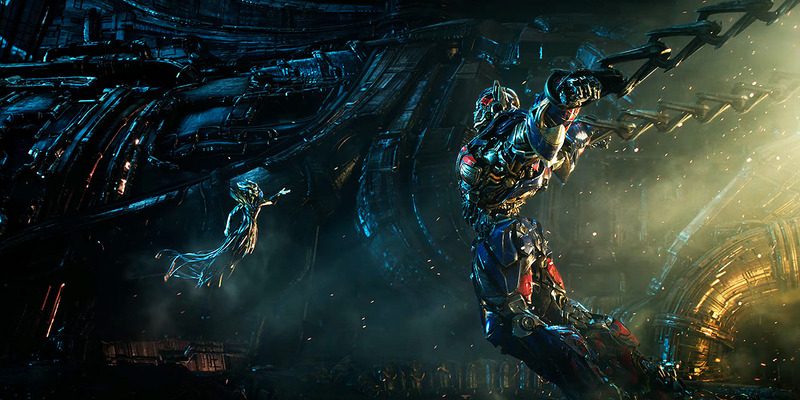 Synopsis: Humans and Transformers are at war, Optimus Prime is gone. The key to saving our future lies buried in the secrets of the past in the hidden history of Transformers on Earth. Five, count them, five Transformers movie directed by Michael Bay have now cursed us been released, and I still can’t figure out why none of them have been any good. Sure, the first movie was okay, but since then the series has gone downhill. The lack of story, and really any sense of direction, make these movies really hard to follow, root for and really enjoy overall, yet, there are fans out there. The Last Knight, which is Michael Bay “last” movie in the series, is another entry of all style and no real substance. The movie starts off on a somewhat good note setting it during The Dark Ages as King Arthur and his army in a midst of battle as they wait for Merlin, played by Stanley Tucci, who has already discovered the Transformers and pleads with them to help Arthur and his army. They do and give Merlin a staff, this beings the secret history and long place for the Transformers. We then cut 1600 years later and see Optimus Prime (Peter Cullen) floating in space aimlessly only to get sucked into his broken home planet of Cyberton. There he meets Quintessa (Gemma Chan), who says he is the “Prime of Life” and tells Optimus he can have his home world back, but only if Earth is destroyed because of its hidden secret (spoiler territory which I won’t get into). Then there is, of course, the human characters. We first meet teenager Izabella (Isabela Moner) who has her own Transfomers and is living in the fallen section of Chicago after the events of Dark of the Moon. She gets rescued by Cade Yeager (Mark Wahlberg), now a fugitive from the government and famous for helping the Autbots that are still around, who now operates a junk yard where Autobots Bumblebee, Hound (John Goodman), Drift (Ken Watanabe), Crosshairs (John DiMaggio) and the Dinobots – the only scene we see them in – are hiding from new agency in TRF, who are hunting down Transformers and killing them. Cade gets involved in the bigger scheme of things when he comes across a medallion that attracts the attention of Megatron (Frank Welker) and Sir Edmund Burton (Anthony Hopkins). 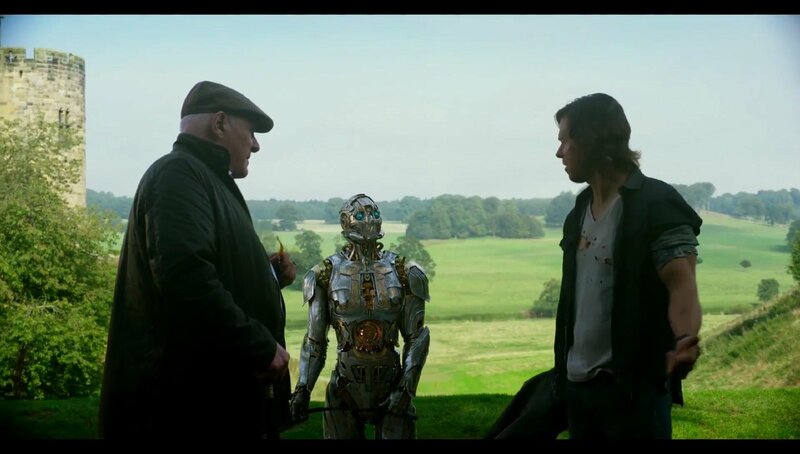 Burton brings together Cade – with the help of his own Transformer butler Cogman (Jim Carter) – and an Oxford professor Vivian Wembley (Laura Haddock) who is an important part of not only the medallion’s history, but why Cyberton is coming to Earth. We also have Optimus Prime acting unlike himself. So, as you can see Transformers: The Last Knight has a lot – A LOT – going on, and that makes it an even bigger mess than it already is. The problem, well at least one of them, is that The Last Knight is adding too much mythology and lore way to late in the game. Also, some of it doesn’t make any sense. We see in the trailers that the Transformers have been on Earth longer than we thought. 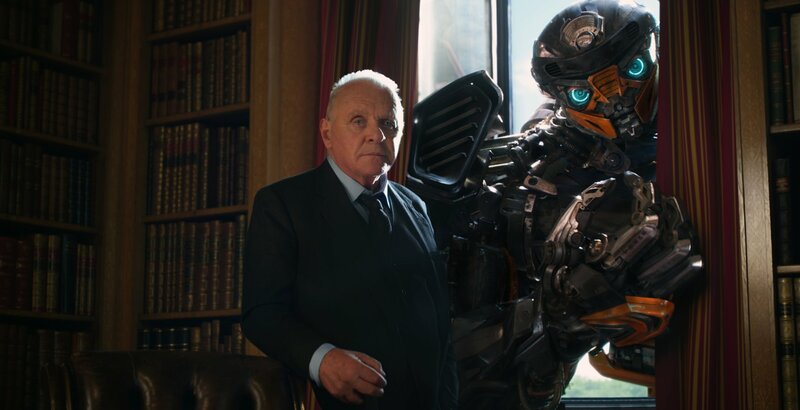 They also been there for big events like World War II – which of course was never mentioned in the films, especially with Bumblebee, who gets his own little flashback scene attacking a Nazi headquarters. Which when you think about, if the Transformers were helping the Allies during the war, shouldn’t it have ended quicker? It’s almost like the film is insulting us that they think we can’t remember anything from the previous movies. Because you know, Stanley Tucci was in the last film, but is only seen here are Merlin during the Dark Ages segment in the movie. Even the Dinobots, and even mini-Dinobots introduced here, which were made to be a big deal in the last movie film, are not even a factor here. Also, if the world didn’t completely known about Transformers before the events of the first movie, how come we see paintings of King Arthur with the three-headed Transformer behind him in Oxford? It’s just dumb how these movies just throw something for the sack of story and plot, logic and proper storytelling be damned. Yeah, I know. 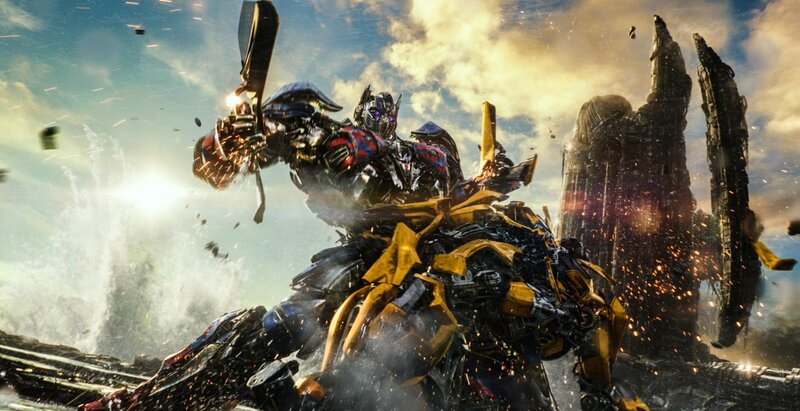 You don’t watch a Transformers movie for its story and plot; you watch it for its action scenes. Look, even I’ll admit, the series so far has had some pretty descent and great action sequences, but that only takes you so far, and eventually it just becomes noise and incoherent action. 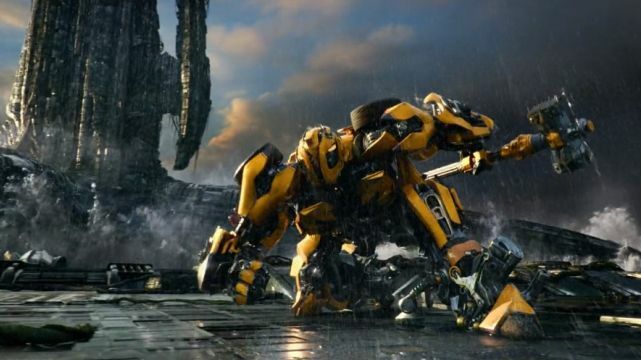 It also says a lot that the best action piece in this movie is the fight that’s been promoted heavy in Bumblebee taking on Optimus Prime, and even with that said, we pretty much see almost most of it in the trailers and TV spots. The real problem is that Transformers shouldn’t be this bad. It’s actually hurts to even think about how bad these movies are. The human characters aren’t interesting enough, cringe-worthy humor and stupid – and I mean take you out of the movie stupid – puns, and once again, stereotypical/slightly racist robots that serve no purpose other than trying to get a laugh or connect with a young audience. Seriously, there are Decepticons here that get introduced similar to a scene ripped right out of Suicide Squad, which could have been fun but the Decepticons and Megatron do absolutely NOTHING in this movie. Are they in it? Yes, but do they serve a purpose? No. Not even close, but you forget they’re in this because they disappear for half an hour or longer. Also, the introduction of Hot Rod (voiced by Omar Sy) is wasted here as he doesn’t really serve a real purpose other than having another fan favorite Autobot and showing off his power of slowing down time. 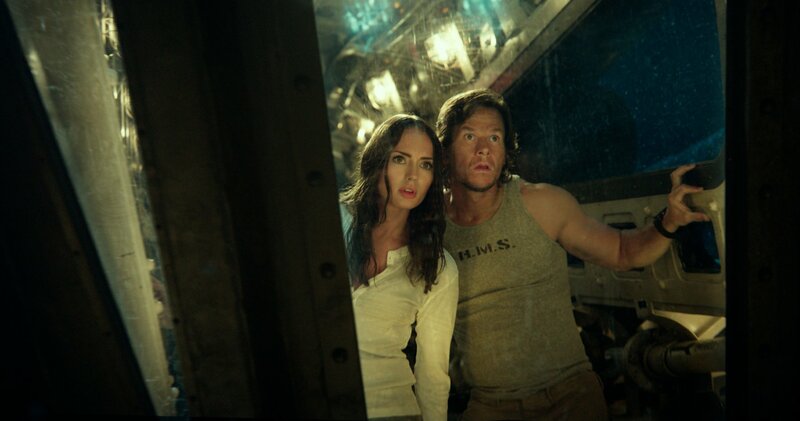 But going back to the humans, Wahlberg looks like he’s at least trying in some scenes, but this could be his last movie. Laura Haddock comes off as snobby when she’s teaching her students, and while her family history is important to the film, that fact that she doesn’t know it makes no sense since it’s pretty much her job. Josh Duhamel comes back as Lennox from the first three movies, and honestly, doesn’t do much – so his character remains the same. Isabela Moner as Izabella plays the tough teenager wants to help the Autobots, but while her character plays a big role in the first act, her character just doesn’t matter for the rest of the movie. Finally, Anthony Hopkins – poor, poor Anthony Hopkins. Hopkins at least adds some star power to the film and rambles on for long periods of time giving off five minute exposition’s dumps. His role is suppose to feel important, but sometimes it just sounds like an old man rambling, which is a shame considering its Hopkins. He also has a dumb sub-plot with the returning John Turturro that goes on for far too long. So let’s get to Optimus Prime, who has been the center of the promotional material since he goes “evil.” He also disappears once he gets saved from space. 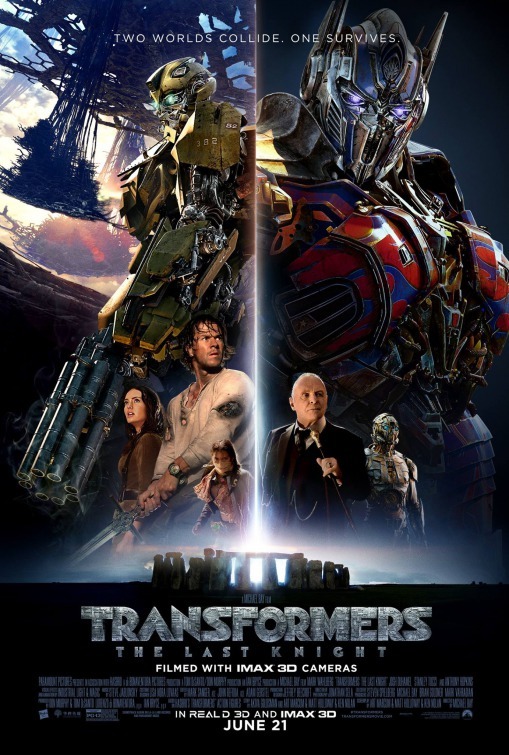 Optimus spends the first half of the movie – where he has about ten minutes (if that) screen time – with Quintessa and is gone for the whole second half of the film to finally appear in the final act to have that fight – and yes – become good again. Is that a spoiler? Come on, we all know he wasn’t going to stay evil. All in all, Transformers: The Last Knight is more or less of the same thing from the other movies. If you’re a fan, you may like it, but if you’re like me, The Last Knight may finally be the last straw. Its one thing to make a bad Transformers movie, it’s another thing to continue to make them thinking they’re good. The adding of mythology and lore does not do the movie any favors as it’s already bloated enough with nonsense action. However, you know what the biggest problem is? Despite it being the last Michael Bay movie – maybe – he can’t help himself from adding a post-credit scene to story he won’t – potentially – be involved in anymore. If Bay truly wanted to leave the series, he would have left the new director enough room to do their own story and thing. But no. Finally, let’s face it, I can sit here and write “this movie is a steaming pile of combined shits that you only fuel by buying a ticket,” but The Last Knight will still make a crap ton of money.